Two sweet slabs of well-poised dubstep-style feminine pressure from Von D & Matt-U. 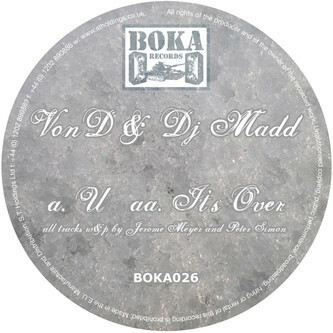 The French and Hungarian producers (respectively) roll up a breezy yet heavyweight hitter with 'U' on the A-side, using the same kind of cyclical percussive loops as F but on a swollen halfstep vibe, while 'It's Over' on the flip leans with a cool R'n'B style embellished with overweight subs and fragrant vox. For fans of Breakage, Joker or SYKNRO.